It bears repeating that personal accounts and oral histories are important for a variety of reasons. They are not only helpful to historians and the lay public for providing a detailed narrative of events before the participant passes but can also be cathartic for said participant. As our Vietnam era veterans are now aging, it is incumbent upon the rest of us to obtain what we can so that we may acknowledge and better understand their experiences. 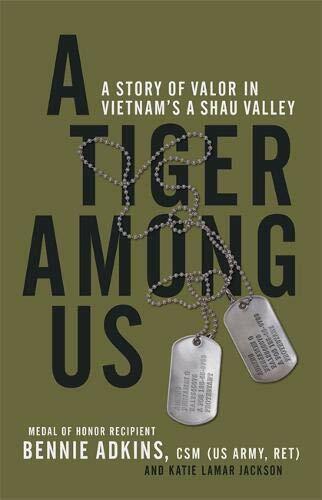 This is not just an account of the valor and bravery demonstrated in a battle in the Vietnam War but a biography of author Sergeant Bennie Adkins as well, a recipient of the Medal of Honor (MoH) for that battle. As with other veterans of earlier conflicts in recent years, a further review of the reports, eyewitness accounts and other documentation resulted in an upgrade to the MoH; in this case in 2014, nearly 50 years after the fact. Adkins spent three tours in Vietnam after first volunteering and qualifying for membership in the United States Special Forces, the Green Berets. He was among the relative first to do so as their existence and formation was championed early on by President John F. Kennedy. Initially as advisors only, they were there to train Vietnamese army troops and local irregular defense forces in the ways of community defense, reconnaissance, intelligence gathering, and counterinsurgency as a means of winning the hearts and minds of the civilian population. Unfortunately, some of these were not always what they seemed; essentially, there were enemy infiltrators as evidenced by the defection of some during the battle in question. As with many nations, Vietnam had its own various tribes and ethnic groups. Many of these were loyal to the Americans and worked hand in hand with them when it came to gaining the sought-for objectives against the Viet Cong and North Vietnamese Army forces. In the case of the battle in the A Shau Valley, a few hundred personnel, of which 16 were Americans, garrisoned a camp which was badly located in a valley surrounded by mountains, far from any logistical support or combat reinforcement, and mostly surrounded by an entire North Vietnamese division. Although eventually overrun and obviously not helped at all by the defecting Vietnamese company mentioned above, the survivors were able to escape and evade the enemy and make their way to a point where they could be rescued, though not without having left the body of one American unrecovered and still missing in action to this day. Adkins’ other two tours in country had much less drama, and he was finally a command sergeant major, basically one of the top non-commissioned officer positions in the military. After running his own accounting business upon retirement from the Army, he is now fully retired and spends his time speaking to organizations, schools, and military groups regarding his experience and advocating for a fully prepared and equipped United States military. Adkins tells his story in a very simple, straight forward, easily readable style with little drama. It is highly descriptive, however, with military terminology defined, when necessary, within the text. Throughout, Adkins maintains a very humble perspective as befits anyone recognized as a hero. Like all other MoH recipients, he proudly wears the decoration on behalf of those with whom he served and, especially, those who made the ultimate sacrifice. As this is a personal recollection, there is no bibliography or footnotes providing sources. Adkins acknowledges that it would not have been possible, however, without the aid and memories of fellow survivors, their records and photographs. Indeed, the photographic section is quite extensive with photos of many of the dramatis personae, locations, and other relevant subjects, including that of the 2014 medal ceremony at the White House with President Barack Obama. Included as well, essentially as an appendix, is his Medal of Honor citation in addition to a list of the other numerous awards and decorations to which Adkins was entitled to wear on his uniform.